Start typing Stacy Delisle into your Google search window and “Stacy Delisle Blog” will pop up as a Google suggestion. Proof that many people have searched for her blog. And with good reason . . . I often found tears coming to my eyes as I read her blog. It is beautifully done. The Journey-through-Grief site slogan is “Where pain and beauty mingle.” That slogan would certainly fit Stacy’s blog as well. Even the background music inspired me to hold pain in one hand and hope in the other, and know that both have significance. First, tell us about your blog. What has it meant to you on your healing journey? How did you get started? My blog, He Will Carry Me was originally started as a way of keeping our family and friends informed of appointments and updates during my pregnancy with Isaac. I found that it was difficult to repeat the same things over and over again to different friends/family members, particularly when it was such bad news. This way, I was able to keep folks informed. Eventually, it morphed into a place where I also would journal my feelings and what God had been teaching me throughout our journey, in addition to just the updates. It was my hope that in sharing my experience openly, it would not only allow me to share Isaac with others, but also help other people who have experienced receiving a poor or fatal prenatal diagnosis for their baby, as well as those who have lost a child. At the end of the blog entry about Isaac’s diagnosis (April 2008), you wrote “I don't know how to pray for this situation or how to navigate it.” Can you say more about what that time was like for you? That time was really difficult for my husband, Spencer, and I. Of course I wanted to pray for healing for Isaac. I wanted to beg God to allow him to live a long, healthy life on this side of heaven… and I did. There was a part of me that was so afraid of what His answer would be if I asked. I knew that in asking, that in presenting that request to God, that He might say no, and at the time, I wasn’t sure how I would handle that. 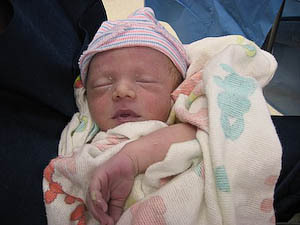 I also had no idea how to handle being pregnant with a baby that I had been told by numerous doctors was going to die. How do you answer other people’s well-intended questions? How do you make the most of the time you do have with you child, even if it is in utero? How do you walk through that in a way that brings glory and honor to God, and that dignifies your child? Of course, we know and believe that God is bigger than a diagnosis, and so we strived to find the balance between hoping for what God could still do, and preparing for what was likely based on what the doctors had told us. Reading your blog entries after the diagnosis, it seems like it was such an emotional rollercoaster—sometimes positive news from the doctor, sometimes negative, working through jealousy of others over Mother’s Day, gradual loss of hope, and long waiting. What kept you going from day to day? Truthfully, some days just putting my feet on the floor and making it through was all I could manage. What kept me going, though, was that I felt deeply convicted by the Lord about the fact that my time with Isaac in the womb was not to be wasted. Psalm 90:12 says, “Teach us to number our days aright, that we may gain a heart of wisdom.” I knew that each day with Isaac was a gift that shouldn’t be taken for granted. And so what kept me going was knowing that I wanted each day with my son to count. I intentionally engaged with him by talking to him, playing him music, and writing him a letter each morning. I wanted to love him well and not have regrets about how I spent my pregnancy with him. I love that you have a blog compilation of letters you wrote to Isaac. What has it meant for you to have written those letters? Those letters have become one of my most treasured possessions. While some of the letters simply documented our day-to-day with him during my pregnancy, all of them include words that I know every parent would want to say to their child. I wanted him to know how proud I am of him and how deeply loved he is. Writing to Isaac each morning quickly became my favorite time of each day because it was time I could intimately spend with my son. At one point you say, “I am pretty resistant to wanting anything to go back to ‘normal.’” How does a person put their life back together after such loss and disappointment? How did you find strength in order to move through the pain? At the time, I thought that once I got back into my normal routine, Isaac would somehow be forgotten, and I didn’t want that. I thought that once I went back to work and got back in the swing of things, people around me would think that I was fine, and perhaps even over everything. The truth is, you don’t get over losing your child, and “normal” had to be redefined. While I do still go to work and engage in many of the activities I did before ever conceiving Isaac, our “normal” is so much different now. Normal now includes visits to the cemetery each Sunday morning before church; it includes conversations with others about my son, gently explaining that he is unfortunately no longer here. It includes re-working the holidays so that we have time and space to remember Isaac, and it includes times that should feel nothing but joyful now feeling more bittersweet because Isaac isn’t here to experience them with us. I think that redefining normal, or finding a “new normal,” is in fact one way that a person can put his or her life back together after such a significant loss. It’s important to recognize that life won’t be the same as it was, and part of moving forward is learning how to assimilate the loss into the tapestry of your life and of who you are as a person. At this point, almost 18 months after Isaac was born and passed away, I can’t say that I am past the pain. It is still there. While not as sharp, piercing, or debilitating as it was originally, there’s always a dull ache. I also can’t pretend that I understand why this had to happen. I truly believed the stage was set for God to intervene and perform a miracle that would point hundreds, if not thousands, of people to Him. I am learning, though, that even through Isaac’s death, He is still doing that… and seeing God work through your child’s life has to be one of the greatest things as a parent. That is definitely one thing that has given me strength… seeing God use Isaac’s life for good and for His glory, even though He didn’t provide the miracle I desperately longed for. Other things that have been a source of strength for me have been the truths of who God is, regardless of my circumstances. I know that despite great heartache and pain, God is still good; God is still a redeemer; He is still in control, no matter how out of control my life may feel. I think that clinging to the sure truths of who God is has been a huge cornerstone for me. What were the most significant things that you did that helped you work through your grief? A lot of things have been really helpful in continuing to work through my grief, several of which I have already mentioned. One was that I started seeing a Christian counselor, even before Isaac was born. Carrying a baby who you have been told will likely not live causes you to begin grieving for that child before he or she even passes away. Having a safe place where I knew I could share my deepest hurts, ugliest thoughts and have it be okay was a huge thing for me… and knowing that I could then process that with another woman who knows the Lord was extremely important. Surrounding myself, and really ourselves as a couple, with the people who allowed us to just be where we were (and who still do) with our grief has also been helpful. Close friends and some family who genuinely care for us, who know that Isaac still matters, and who haven’t been afraid to enter into our pain with us have been a key component to allowing us to work through our grief. Knowing that we didn’t have to have it all together, but rather had the space to just be. Blogging has definitely helped, as has connecting with other woman, particularly other Christian women, who have lost a child. Whether it has been through email, on the phone, or in real life, it is so helpful to know that you are not alone. I think the last thing would be reading. There are some great Christian books out there about the grief process, both specific to the loss of a child and about grief in general, that have really helped me. And of course, seeking God’s word… even in the times I may not have wanted to. He has been so faithful in meeting me each and every time. Several times in your blog you mention how hard anniversaries were—anniversaries of your first baby’s miscarriage, his or her due date, Isaac’s due date, his birthday each month after his birth, holidays, etc. What do you do to mark these significant dates? Well, we found out that I miscarried my first child on November 2, 2007. Isaac’s due date was November 2, 2008. For whatever reason, November 2 doesn’t feel very significant to me; we knew for quite a while that Isaac would be born before that day, and so I suppose I never became overly attached to it. October 7, though, that is pretty significant for us. In fact, the 7th of each month in the first year since Isaac died was fairly impactful. On the 7th of each month leading up to October 7, 2009 (when Isaac would have turned one), Spencer and I would be sure we made it to the cemetery. In addition to that, I took off work on the 7th of the first few months. I wanted to be home during the time that Isaac lived, from 8:33-8:49 am to just sit and reflect and think about him. As the months went on, being at work on the 7th felt more okay. On October 7, 2009, what would have been Isaac’s first birthday, Spencer and I took off work and did some things together that were special for us when I was still pregnant with Isaac. We of course started by visiting the cemetery for a while. Spencer and I each wrote a letter to Isaac, which was a very special part of my time with him while I was still pregnant with him, read them to him, tied them to a balloon, and let them go. We then planned on going for a hike at a local state park, where we went on a hike when I was about 18 weeks pregnant with Isaac. The park ended up being closed, so we went elsewhere for our walk. We plan, though, to go back to this park each year for a hike on Isaac’s birthday as a way to remember him and remember the day. What were the most significant things people did to support you during your grief? Romans 12:15 encourages us as Christians to rejoice with those who rejoice, and mourn with those who mourn. I think the most significant thing people did to support us through our grief journey (which we’re still on) is the fact that they were willing to enter into our pain with us and just be with us in it… family and friends who prayed with us, cried with us, go to the cemetery with (and without) us, who still ask about Isaac, and who understand that his birth and death continue to have a profound and significant impact on our lives. The people who understand that attending my baby shower in preparation for our daughter to be born in just a few weeks is a bittersweet thing, full of joy as we anticipate her arrival, yet full of sorrow that we never got to prepare for Isaac in that way. These are people who would intentionally make time to sit and talk with us, ask how we’re really doing, and who have sought to understand what it is like to lose a child even if they have never lost one themselves. It has been significant for us that people remember Isaac’s birthday, that they remember him at Christmas time, and that they really view Spencer and I as parents. I think the other significant thing people did was just helping to meet our basic needs… providing meals, cleaning our house, running quick errands. Grief is exhausting. Grief on top of the physical recovery of giving birth is even more exhausting. Sometimes it was all I could do to just put my feet on the floor some days, and so having people meet these practical needs for us in order to eliminate that burden was incredibly helpful. As a person of faith, how did Isaac’s difficult pregnancy and death impact your relationship with God? This is a great question. I think the biggest way that my pregnancy with Isaac and then his death have impacted my relationship with God is that it has caused me to really look more closely at what I know for certain to be true, and to dig deeper into the ideas that sound well and good, and to find the truth behind them. For instance, it sounds nice to talk about how babies go to Heaven; but I wanted to understand for sure that Isaac was there, and I wanted the biblical proof for that. I also spent a lot of time trying to reconcile who I know God is, and the circumstances He allowed. I didn’t understand how on the one hand I could read that God is good, and yet on the other, this was the same God who allowed my son to die. I didn’t understand how on the one hand we could know God as the Great Physician, yet He didn’t intervene to allow my son to be okay. I am thankful that God protected my heart and never allowed me to enter the place where I doubted His truths; I just very much wanted to be able to reconcile our circumstances with God’s character. In some ways I have; and in other ways, I have come to the place where I realize that on this side of heaven, I just might not be able to. So, I know I need to continue to move forward in faith, trusting that even in the midst of life’s fiercest storms, He will continue to meet us and carry us. You mention a lot of books. Are there any books you highly recommend as must-reads for families/mothers who have lost children or for other people in grief? Absolutely. The best book I have read on grief is A Grace Disguised: How the Soul Grows through Loss by Jerry Sittser. Sittser loses his mother, wife, and youngest daughter in the same tragic car accident. He is a strong man of faith in the Lord, and is extremely authentic about his struggle, grief, and pain in his book while still pointing others to Christ. Specifically related to the loss of a child, I would highly recommend I'll Hold You In Heaven by Jack Hayford, and Safe in the Arms of God by John MacArthur. I found these books in my quest to understand for sure that Isaac would be in Heaven, and why this was true. Sure, it sounds nice to say that babies go to heaven when they day; but I wanted to understand the biblical truths behind that, and both of these books provided that. There’s another book coming out in May, called I Will Carry You: The Sacred Dance of Grief and Joy written by Angie Smith, the wife of Todd Smith who sings in Selah. Angie and Todd lost their fourth daughter, Audrey, in April of 2008. She has been a tremendous support to me, and though I haven’t read this book yet, I will… and I know it will be fabulous. Now you are a few weeks away from your daughter’s birth date. You talk in your blog about how this pregnancy stirred up fresh grief for Isaac. 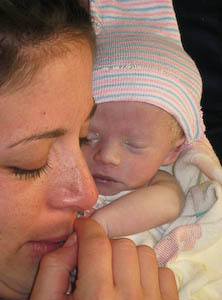 How do you find ways to honor your grief in the midst of the excitement of meeting Elaina? It’s a difficult thing to balance the missing and the excitement… the sadness and the joy. I don’t know that I have any great insights here about how I find ways to honor my grief in the midst of my joyful anticipation of meeting Eliana, except to say that I just allow myself to feel. On days I am missing Isaac a lot, I allow myself the space and the grace to experience that. On the days when I am really excited about Eliana and the missing of Isaac is a little less, I allow myself the room for that, too, without feeling guilty. It’s a bit tiring managing such polarized emotions, sometimes at once; but I can see evidence of how the Lord has continued to expand my capacity in this way. I suppose it’s one of those things that will just always be there. I love my daughter tremendously and I can’t wait to meet her… but I know that on this side of heaven, our family will not feel complete.